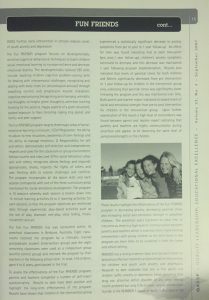 This is an article about the need for scientifically validated resilience and anxiety programs explained by Dr Paula Barrett. “Anxiety disorders are among the most prevalent mental health problems in childhood and adolescence affecting up to 21010 of all children and youth. This estimate indicates that 1 in 5 children and youth or 4 to 6 students within a classroom of 30 children are at risk for experiencing an anxiety disorder. Currently, over 1 million Australian children under the age of 18 suffer from anxiety and/or depression. The World Health Organization has stated that obesity, early onset diabetes, anxiety and depressive disorders will be more prevalent in Western countries than any other health problem in the next 30 years. Further, the World Health Organization has found that mental health disorders are responsible for an estimated 110/0 of the disease burden worldwide which is projected to rise to 15% by the year 2020. In time, every Australian family will need to access the medical care system to access mental health care (National Mental Health Council of Australia, 2004). Once present, childhood anxiety disorders tend to be chronic and recurrent and rarely remit without treatment. In addition, many children who experience clinical levels of anxiety will experience more than one disorder with recent estimates suggesting that 65% to 95% of anxious children and youth will experience comorbid anxiety disorders. 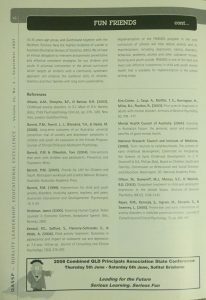 Childhood anxiety also has a strong association with depression and childhood anxiety disorders may actually precede the development of depression with studies indicating that 220/o to 44010 of anxious children and youth also experience depression. Given the significant relationship between anxiety and depression and the precedence of anxiety disorders, effectively treating anxiety in childhood and adolescence may help reduce the likelihood of a depressed mood in later life (Kendall, Safford, Flannery-Schroeder, Et Webb, 2004). Unfortunately, most children and youth who suffer from anxiety will not actually receive clinical intervention (Olfson, Gameroff, Marcus, Et VVaslick, 2003). At the moment, only 5% of people suffering from anxiety or depression receive help. And for those who do many will terminate before program completion, some will relapse, and others will fail to respond to treatment (Barrett and Ollendick, 2004). Additionally, 74010 of mental illnesses commence before 18 years of age (Mental Heath Council of Australia; Kim-Cohen et al. 2004). Anxiety disorders in childhood are frequently overlooked as the symptoms are often unrecognizable. Anxious children tend to be shy, cooperative, compliant, and may present as the “perfect” child within the school setting and when away from home. Increased attention is given to children with disruptive behaviours as they clearly interfere with daily life functioning, home school life (Albano, Chorpita, Et Barlow, 2003). Anxiety can become a chronic condition for man, children and can subsequently affect several life including academic performance, social interaction, self-confidence, and the ability to enjoy everyday life experiences (Barrett, 1999). Disruptions in their academic performance tend to occur as anxious children may find it difficult to start and complete tasks due to the fear that their work will not be good enough. These children tend to be highly perfectionist and often experience a higher dependence upon others which can be seen through their constant reassurance seeking and needed approval from others (it. peers, parents, and teachers). Such a child may continually ask the teacher, “Is my work okay, did I do a good enough job?” or their friends, “Am I still your best friend today?” Anxious children tend to be overly sensitive to criticism, have low self-esteem (Barrett, 1999) and usually become preoccupied with their worries and the uncomfortable physiological arousal that accompanies them (hyperventilation, nausea, sweating, loose bladder, etc.). 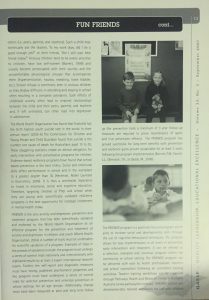 School refusal is commonly seen in anxious children as they display difficulty in attending and staying in school often resulting in a complete avoidance. Such effects of childhood anxiety often lead to strained relationships between the child and their peers, parents, and teachers and, if left untreated, can often lead into depression in adolescence. The World Health Organization has found that Australia has the forth highest youth suicide rate in the world. In their annual report (2005-6) The Commission for Children and Young People and Child Guardian found that suicide is the number one cause of death for Australians aged 10 to 35. These staggering statistics create an ethical obligation for early intervention with preventative programs for children. Evidence-based resilience programs have found that school based prevention is the best milieu. Social and emotional skills affect performance in school and in the workplace to a greater degree than IQ (Heckman, Nobel Laureate in Economics, 2006). It is thus a worldwide imperative to invest in emotional, social and cognitive education. Therefore, targeting children at Prep and school when they are young with scientifically validated resilience programs is the best opportunity for strategic investment in mental health today. 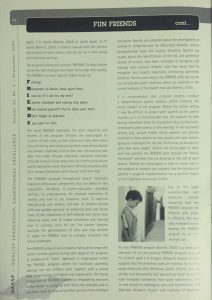 FRIENDS is the only anxiety and depression prevention and treatment program that has been scientifically validated and endorsed by the World Health Organisation as an effective program for the prevention and treatment of anxiety and depression in children and youth (World Health Organization, 2004). A number of trails must be undertaken for scientific validation of a program. Examples of steps in the process of validation include: the program must undergo a series of control trials nationally and internationally with replicated results by at least 2 expert international research teams. 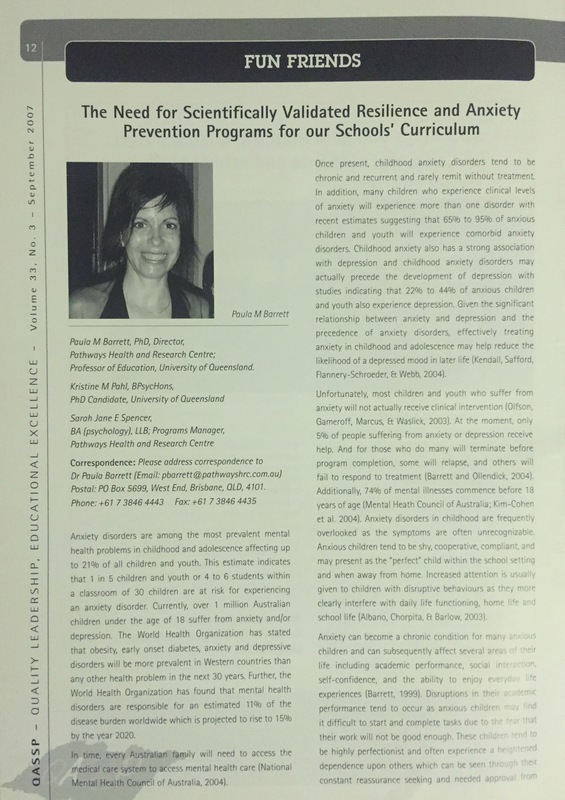 Further, the self-report and diagnostic measures must have strong, published psychometric properties and the program must have undergone a series of control trials for selective prevention and universal prevention in school settings for all age groups. Additionally, change must have been measured at post and long term follow up (for prevention trails a minimum of 3 year follow-up measures are required to prove maintenance of gains and true prevention effects). The FRIENDS program has proved successful for long-term benefits with prevention and resilience gains proven sustainable for at least 3 years following the program implementation (Barrett, P.M , Farrell, L.J., Ollendick, T.H., Et Dadds, M., 2006). The FRIENDS program is a positively focused program which aims to increase social and developmental skills through the use of cognitive-behavioural techniques. The program allows for easy implementation at all levels of prevention, early intervention and treatment. It can be offered as a selective, indicated and universal program within the community or school setting. The FRIENDS program be delivered with ease by health professionals, teachers and school counsellors following an accredited workshop. (…) FRIENDS utilises two developmentally tailored workbooks for use with children (aged 7.11 years) (Barrett. 2004) or youth (aged 12-17 years) (Barrett, ‘200n), a leader’s manual with the content and process in each session, and can be run in both group and individual settings. Remember to Relax. Have quiet time. I can do it! I can try my best! Explore solutions and coping step plans. Now reward yourself! You’ve done your best! The word FRIENDS highlights the main objectives and themes of the program. Children are encouraged to: 1) think of their body as their friend as it tells them when they are feeling worried by giving them clues (physiological and somatic response); 2) to be their own friend and to look after their body through emotional regulation exercises; 3) to talk to their friends when they are in difficult situations and to help others when they are in difficult situations, and; 4) to reward themselves when they’ve tried their best. 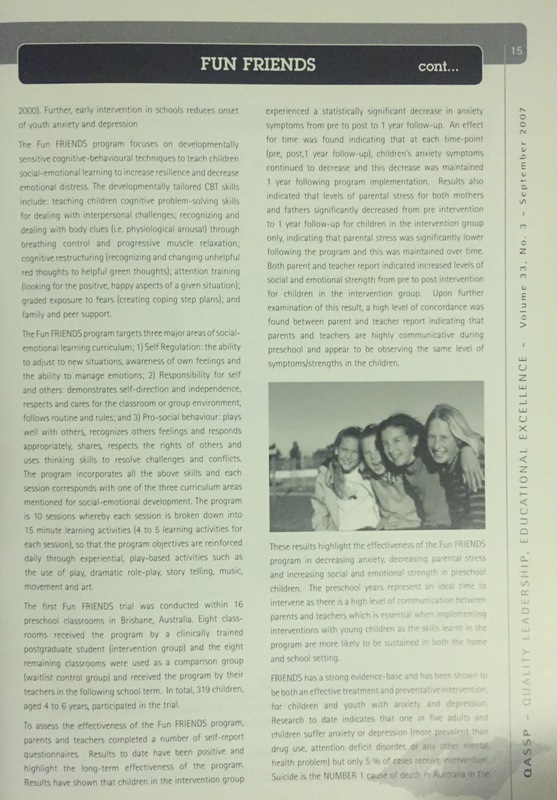 The FRIENDS program incorporates several important cognitive-behavioural components that are based on skill acquisition, including, 1) psycho-education regarding feelings; 2) understanding the physical expression of anxiety and how to use relaxation skills; 3) cognitive restructuring and positive self-talk; 4) problem-solving skills and graded exposure tot achieving goals and facing tears; 5) the importance of self-rewards and trying hard, achieving goals, and; 6) relapse prevention and learning how to maintain skids for life. Inc booster sessions facilitate the generalisation of skills and help children to apply the FRIENDS skills to everyday situations and future challenges. The FRIENDS program also includes a family skins component which involves parents during each stage of the program. A collaborative “team” approach is emphasized within the FRIENDS program where the facilitator, parent(s), siblings and the children work together with a shared goal of increasing confidence and coping skills. The family component of FRIENDS is aimed at empowering everyone in the family to recognize their skills and strengths and to use these skills to help one another become more confident and brave. Parents are educated about the development of anxiety in childhood and the distinction between normal developmental fears and anxiety disorders. Parents are taught about the identification of the risk and protective Linton; of anxiety; they learn strategies to recognize and manage their anxious children; and they learn how to recognize and modify negatively reinforcing parenting practices Parents learn about the FRIENDS skills during the two structured parent sessions which are outlined in the current editions of the leaders manuals (Barrett, 2005). It is recommended that program leaders conduct 2 comprehensive parent sessions which comprise the entire content of the program. Within the school setting it may be difficult to attract some parents to the parent sessions so it is recommended that the sessions be held during convenient times for the parents (e.g. during lunch, immediately after school, in the evening). In the treatment setting (e.g. private health clinic) parents are actively involved in every session as they usually join each session (group or individual) for the last 30 minutes to discuss the skills that were taught. Parents are encouraged to work with and practice the FRIENDS skills through the “family homework” activities that are assigned at the end of each session. Parents are encouraged to take an active role in the program as research has indicated that the inclusion o’ parents in program implementation has a Positive impact on the treatment of anxious children. Due to the large evidence-base and extensive results indicating that the FRIENDS program for children and youth is effective, the next step in research was to develop the FRIENDS program for an even younger age. The Fun FRIENDS program (Barrett, 2007), is a downward extension of the pre-existing FRIENDS programs targeted for children aged 4 to 6 years. Research reviews strongly suggests that the preschool years are essential for building social-emotional skills (Heckman, 2000). Children who are socially and emotionally well adjusted to do better at school, have increased confidence, have good relationships, take on and persist at challenging tasks and communicate well (National Research Council and Institutes of Medicine 2000). Further, early intervention in schools reduces onset of youth anxiety and depression. The Fun FRIENDS program focuses on developmentally sensitive cognitive-behavioural techniques to teach children social-emotional learning to increase resilience and decrease emotional distress. The developmentally tailored CBT skills include: teaching children cognitive problem-solving skills for dealing with interpersonal challenges; recognizing and dealing with body clues (i.e. physiological arousal) through breathing control and progressive muscle relaxation, cognitive restructuring (recognizing and changing unhelpful red thoughts to helpful green thoughts); attention training (looking for the positive, happy aspects of a given situation); graded exposure to fears (creating coping step plans); and family and peer support. The Fun FRIENDS program targets three major areas of social-emotional learning curriculum; 1) Self Regulation: the ability to adjust to new situations, awareness of own feelings and the ability to manage emotions; 2) Responsibility for self and others: demonstrates self-direction and independence, respects and cares for the classroom or group environment, follows routine and rules; and 3) Pro-social behaviour: plays well with others, recognizes others feelings and responds appropriately, shares, respects the rights of others and uses thinking skills to resolve challenges and conflicts. The program incorporates all the above skills and each session corresponds with one of the three curriculum areas mentioned for social-emotional development. The program is 10 sessions whereby each session is broken down into 15 minute learning activities (4 to 5 learning activities for each session), so that the program objectives are reinforced daily through experiential, play-based activities such as the use of play, dramatic role-play, story telling, music, movement and art. The first Fun FRIENDS trial was conducted within 16 preschool classrooms in Brisbane, Australia. Eight class-rooms received the program by a clinically trained postgraduate student (intervention group) and the eight remaining classrooms were used as a comparison group (waitlist control group) and received the program by their teachers in the following school term. In total, 319 children, aged 4 to 6 years, participated in the trial. To assess the effectiveness of the Fun FRIENDS program, parents and teachers completed a number of self-report questionnaires. Results to date have been positive and highlight the long-term effectiveness of the program. 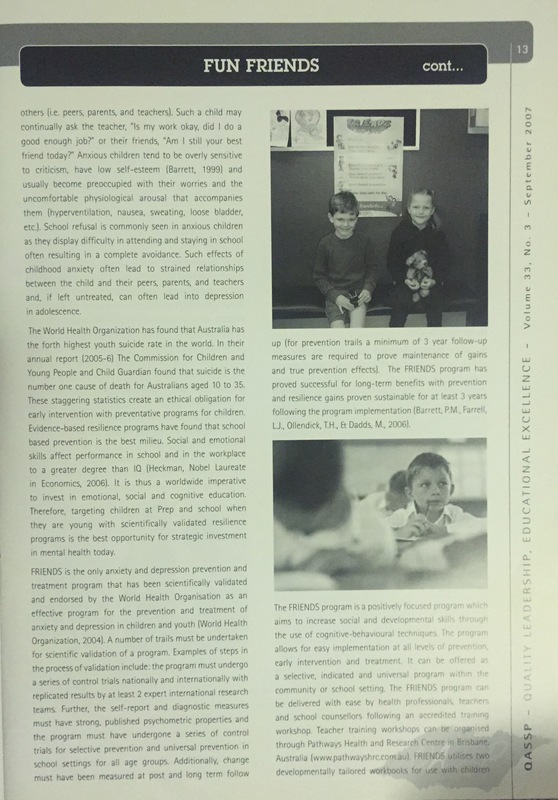 Results have shown that children in the intervention group experienced a statistically significant decrease in anxiety symptoms from pre to post to 1 year follow-up An effect for time was found indicating that at each time-point (pre, post,1 year follow-up), children’s anxiety symptoms continued to decrease and this decrease was maintained 1 year following program implementation. 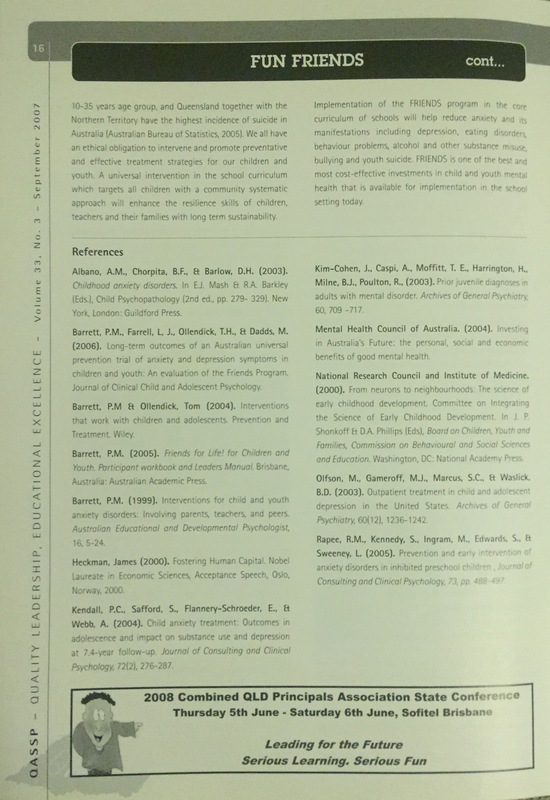 Results also indicated that levels of parental stress for both mothers and fathers significantly decreased from pre intervention to 1 year follow-up for children in the intervention group only, indicating that parental stress was significantly lower following the program and this was maintained over time. Both parent and teacher report indicated increased levels of social arid emotional strength from pre to post intervention for children in the intervention group. Upon further examination of this result, a high level of concordance was found between parent and teacher report indicating that parents and teachers are highly communicative during preschool and appear to be observing the same level of symptoms/strengths in the children. These results highlight the effectiveness of the Fun FRIENDS program in decreasing anxiety, decreasing parental stress and increasing social and emotional strength in preschool children. The preschool years represent an ideal time to intervene as there is a high level of communication between parents and teachers which is essential when implementing interventions with young children as the skills learnt in the program are more likely to be substained in both the home and school setting. FRIENDS has a strong evidence-base and has been shown to be both an effective treatment and preventative intervention, for children and youth with anxiety and depression. Research to date indicates that one in five adults and children suffer anxiety or depression (more prevalent than drug use, attention deficit disorder, or any health problem) but only 5% of cases receive intervention. Suicide is the NUMBER 1 cause of death in Australia in the 10-35 years age group, and Queensland together with the Northern Territory have the highest incidence of suicide in Australia (Australian Bureau of Statistics, 2005). We all have an ethical obligation to intervene and promote preventative and effective treatment strategies for our children and youth. .A universal intervention in the school curriculum which targets all children with a community systematic approach will enhance the resilience skills of children, teachers and their families with long term sustainability.